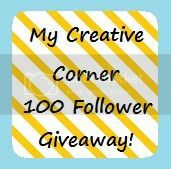 My Creative Corner: 100 Follower Giveaway! This is just a small token of my appreciation to say thank you - when I started this last year it was more for me, to keep me motivated when I started to cross stitch again. Little did I know in less than twelve months there would be over 100 of you who put up with me. So, if this sounds like something you might be interested in then it is very simple, just comment on this post and you will be entered! Absolutely anyone can enter, no matter where you are in the world! The closing date will be Saturday 2nd of March so you all have plenty of time to join in and share the fun! Hey, I'm the first who joins this giveaway. Please, count me and compliments for all the followers you have. Congratulations on reaching well over 100 . lovely giveaway please add my name, I will be having one soon so too.hugs. Wow that's a generous giveaway. I've been a follower for a while and would love to be entered into your draw. Here's to the next 100 followers! What a nice giveaway and I would love to enter. I am a follower and I'll post on my on blog about your giveaway. Thank you so much for giving us the opportunity to win such a lovely gift. Emma please count me in! I'll arrange a sidebar announcement for your giveaway! Congrats on this lovely event! Of course not Annie, you have been a follower for a long time so of course you are included! Congrats on 100 followers! I'd love to be included and I'll add this to my sidebar! Wonderful prize, thaose thread are beautiful. Please eter me, I'll post on my blog too. Wonderful giveaway...please add my name! Congrats on the 100 followers. gorgeous, and congrats on the 100 followers! Contrats on 100 followers! This is such a lovely giveaway. Please count me in. What a fab giveaway and huge congratulations on the 100+ followers and here's to the next 100! Please enter me into the giveaway, cheers! I love that there are so many amazing blogs to follow! Congrats on reaching (now over) 100 followers. I am now also a follower. Cross-stitch is one of my passions, so I'm really going to enjoy your blog. Congs on reaching over 100 followers - you now have 115!! Please enter me for a chance to win and I have posted about it on my blog. Wow Emma what an awesome giveaway. I thought I was a follower (thats what I get for thinking) and wasn't but am now. I've been reading your blog for a while. I would love to be entered in your giveaway. I have just discovered your blog. I love your WIPs in progress, good start on the Joan Elliott. I would love to be entered in your give a way. Congrats for having 100 followers, already 120 by now!I'd love to take part if you don't mind posting to Greece! We don't get handdyed fabric or threads here! I am a new follower hence number 121 and I added your button on my sidebar! Of course you can enter! :) Good luck! Happy 100 followers! I'd love to be entered in your giveaway! Well done on reaching 100 followers! You are so generous and I'd love to be entered into your giveaway please. I've popped your wonderful little widget onto my blog sidebar. I'm glad I found your blog. I'm not very clever in figuring out how to follow my followers, so sometimes I just happen upon them. That is a wonderful giveaway package! I'd love the opportunity to throw my name into the mix. I've already put your cute little button on my blog. Seguidora nova GFC 124.Parabéns por mais de 100 e obrigada por convidar para fazer parte. What a wonderful giveaway! Congratulations on getting far past the 100-follower mark. I read about your blog on Faith's blog. I'm a new follower of your blog now, too! Thanks for the chance. Congratulations!I am a follower, and would love a chance in your giveaway. Off to post a link on my blog as well. Thanks for the chance! Congrats on reaching the milestones ! Please count me in. Congratulations! Please enter me in your wonderful drawing. Thank you. Congratulations on 100 followers. I am a new follower of your blog too, looking forward to seeing more of your stitching! Congrats on making 100 followers! I look forward to watching your stitching progress and would love to enter your giveaway. Great giveaway, I'm a big fan of Crafty Kitten. Am a new follower thats happy to receive some inspiration. Am looking forward to following your progress and would like to enter your giveaway. Will mention you in my next post. Congrats on making 100 followers. Thanks for the giveaway. Can I please be entered into this exciting giveaway. I have posted on about your giveway. Can See you are stitching 'Twilight Magic' I remember seeing it in the magazine and thinking what silly people would think of stitching such a massive project ... little did I know that that would inspire me to google Heaven and Earth designs and the rest is history. The World of Cross Stitching will be having another HAED in their next month's issue. How awesome to have over 100 followers!! I can only hope to be that popular in a year! Congratulations on your 100+ followers. I love reading your blogs/ post. I have put a link in the sidebar of my blog to your give-away. Just found your blog and become a follower. I'd love to be entered in your giveaway please. My blog should be linked to my profile. Pop over , I'm about to have a 200 follower giveaway ,lol. I would love to be entered into your giveaway! Congrats on 100 followers!! Please count me in for the giveaway. I've got a link your giveaway up on my sidebar! Please count me in for the giveaway and visit my blog at wisdomwithneedleandthread.blogspot.com. Congratulations on a 100 followers - I hope that it is not long before you have 200! Hopefully not too late to enter this giveaway. New follower from www.thenextbeststitch.blogspot.com. Please enter me! !